Couples who decide to participate in divorce mediation are often able to save considerable time and money during their split, especially those who show up to their mediations well prepared. Whether or not you’re decided to have a divorce attorney represent you during your mediation, it is a good idea to start to preparing by following the tips outlined below. Assets and Possessions. Make a detailed list of all the assets and possessions that you and your spouse currently own. Be sure to include all property, vehicles, bank accounts, stocks, retirement accounts, life insurance policies, and personal property that you are aware of—regardless of whether it was acquired prior to, or during the marriage. Sources of Income. List all sources of income that you and your spouse currently have. Think beyond only the income that is derived from working and also include any funds that are received in the form of social security payments, child support, pension disbursements, etc. Recurring Expenses. Make a list of all recurring expenses that you and your spouse are currently paying. This might include payments made on student loans, mortgages, car loans, alimony or child support orders, insurance policies, etc. Make a Budget: Draft a monthly budget that reflects your current monthly expenses. Next, make a second draft that reflects what your expenses will likely look like post-divorce. Doing this will help you determine what sort of divorce settlement will work for you. Think About What You Want and What You Need: While it is not always possible for both parties to walk away from a divorce with everything that they want, it is still important that you take time to think about what you would like to end up with and what you feel you need to have in your post-divorce life. Reflecting on what you want and need will help you sort out the range of divorce terms that would be acceptable to you. Consider What’s Best for Your Children: If you have children, prior to your mediation be sure to think about which type of timesharing (custody) arrangement would be most beneficial to them. Consider how different living arrangements will impact the stability of their everyday lives and try to determine what would be best for them given their respective ages and personalities. 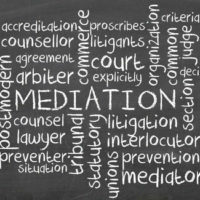 Discuss the Mediation Process With Your Attorney: Before attending any divorce mediation session, be sure to ask an attorney any questions that you might have about the mediation process. Knowing what to expect often helps people feel more at ease and enables them to get as much out of their mediation as possible. Also, tell your lawyer what you have already done to prepare for your divorce mediation and ask them if there is anything else that you should do in order to be well prepared. If you’re getting divorced in Florida and are looking for legal advice, feel free to contact family law attorney David L. Hirschberg. Whether you plan to attend mediation pre-suit, or you are ready to file your petition for dissolution with the court, Mr. Hirschberg’s extensive experience counseling and representing divorce clients in Florida will greatly benefit you. If you’re looking for a firm that is committed to exceptional service and top caliber representation, call our Boca Raton office today at (561) 288-8620 to schedule a consultation.